KIm Kardashian West appeared on NBC’s “Tonight Show Starring Jimmy Fallon” on Thursday and opened up about the viral photos of Kanye West, Timothée Chalamet, Kid Cudi, and Pete Davidson hanging out. 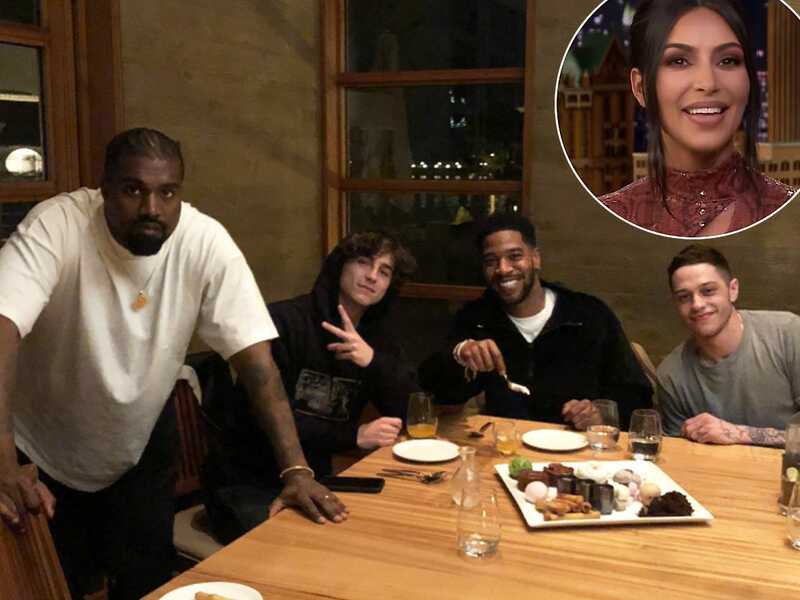 Kardashian West, who took the photos of the guys having dinner to celebrate Cudi’s birthday in late January, said that she received plenty of messages from friends who were interested in two stars in particular. “I got more DMs from my friends, from my gay friends, from my straight friends, everyone asking me about Timothée and Pete,” she said. The KKW Beauty creator appeared on NBC’s “Tonight Show Starring Jimmy Fallon” on Thursday and opened up about the unexpected response she got after posting several photos of the four stars celebrating Cudi’s 35th birthday in late January. Kardashian West explained to Fallon that she accompanied West, Chalamet, Davidson, and Cudi to the restaurant called Nobu, not realizing that it was going to be “a guys dinner.” After sharing the photos with her Twitter followers, she received tons of messages from friends who were interested in Chalamet and Davidson. The reality TV star went on to say that she didn’t want to intrude on their “guy time,” so she stayed in the background and kept busy with her phone. “It was such a fun night, everyone just had such a good time, the vibe was so good, and I didn’t want to ruin it, so I just sat in the corner and documented it for them,” Kardashian West said. When Kardashian first shared the photos from Cudi’s celebration, some fans were confused as to how the stars all ended up in the same room. However, West, Chalamet, and Davidson are all good friends with the musician. Chalamet also credited the rapper to playing a significant part in his life. Speaking to GQ in 2018, the “Beautiful Boy” star said that he met Cudi backstage at a concert in Montreal, Canada, and had a lengthy conversation with the rapper that made him reevaluate his future as an actor. As for West’s connection to Cudi, the “I Love It” singer has known him for a decade. They also collaborated under the name Kids See Ghosts for an album that was released in June 2018.